From the LinkedIn Training courses I run I know that Sales Leaders and Business Owners appreciate guidance when assessing and planning how best to use LinkedIn, for themselves and their team. Monitor and review progress of you and your team, and identify potential improvements. And if you need guidance, training or support please do get in touch with me, Mark Stonham at Wurlwind. There is actually a sixth level, the first being people who haven’t yet registered with LinkedIn, but for those who have here’s a quick tour guide. As you read through, consider where you are, and also where your team members and colleagues are, and where you would like to get to. A high percentage of LinkedIn profiles are still at this stage. The LinkedIn account was created and the current role was added. Maybe there were good intentions to return to add more details. But for whatever reason the profile has been neglected. On the one hand there are missed opportunities for business owners and professionals at this level. On the other hand a neglected profile might well have a detrimental and negative impact, on you, and on the company you work for. It’s surprising how little it takes to be passed over and not contacted, if for example you’re trying to call prospects and you want them to return your call. Adding a good photo, updating all the contact details, completing details about each work position, education etc. makes the profile look much more professional. This might take a couple of hours, so is something that can be done in an evening or over the weekend. This is perhaps equivalent of having your CV online. Activity at this level is about connecting with the people you already know offline, with colleagues, customers, business partners who you deal with regularly. If you’re an account manager with no new-business responsibility this level may be adequate, for now. Connect with your customers and keep in touch regularly offline and online, and share valuable content with them. Getting to level 3 takes more thought, but pays greater dividends. It’s about shifting your focus from ‘About me’ to ‘About the value I deliver’. It’s about starting to show your knowledge of and experience in your customers markets. Let me illustrate the difference. Profiles of sales people I review are frequently focused on results achieved for their employer – how they hit targets, over-achieved and so on. That has little value for customers and prospects. It might even be harmful when trying to secure a meeting. Including examples of problems solved, benefits delivered and impacts made on previous customers businesses has far more impact. It shows your expertise and that you have value to offer, in exchange for time with a prospect. It also helps them realise they will need to spend less time bringing you up to speed with their sector and their business. You’ll find tips to help you think about your personal brand and profile here. If your role is new business then this should be the minimum level to aim at. By including and optimising keywords in your profile you are more likely to be found by prospects. By including benefits delivered you are more likely to win some time with key people, for example for that initial phone call. You’re also in a stronger position to connect with people through LinkedIn discussion groups and use that as a lead generation opportunity, to start conversations with people who could become customers or introducers. This refers to being socially engaged – in a professional sense. It’s equivalent to finding common ground with people in person through your respective backgrounds, life experiences, even hobbies and interests. It’s a way to move beyond the formality, and build emotional connections through shared interests, values, concerns etc. If you took a client out for a drink what sort of mix of topics would you discuss? What part of your life would you also feel comfortable chatting about? In moderation, that side exists on social media and even in LinkedIn. However, moving swiftly and seamlessly through to sales conversations is essential. One technique is to mentioning 3-5 trigger events that previous prospects were going through that led to them becoming a customer. Having developed an engaging profile, and a larger network, it’s worth committing time to reap the benefits. Keeping on-top of who’s viewing your profile, emails, invites, and notifications from discussions you’re part of is pretty essential. Groups can be a rich source of new sales conversations, so it’s worth investing time in them. Using LinkedIn as a social prospecting system does take time commitment, of perhaps an hour a day, but for new business with high value clients this can be a lot more effective than alternatives. If you attend business network meetings you’ll know it’s useful to take a referral strategy, seeing who people can introduce you to, rather than trying to sell directly to the room. This approach on LinkedIn is very effective too, as you are develop work of mouth marketing and lead generation. If you run or work for a larger business, consider the benefit if your head of customer services or your delivery team were operating at this Social level, individually, or through your LinkedIn Company Page or your own discussion group. and then your prospects, who will see not just the information and engagement but also the success community that you have created. Getting to this level will take some planning, change, investment and time. However, do you think it could really accelerate your marketing and sales? 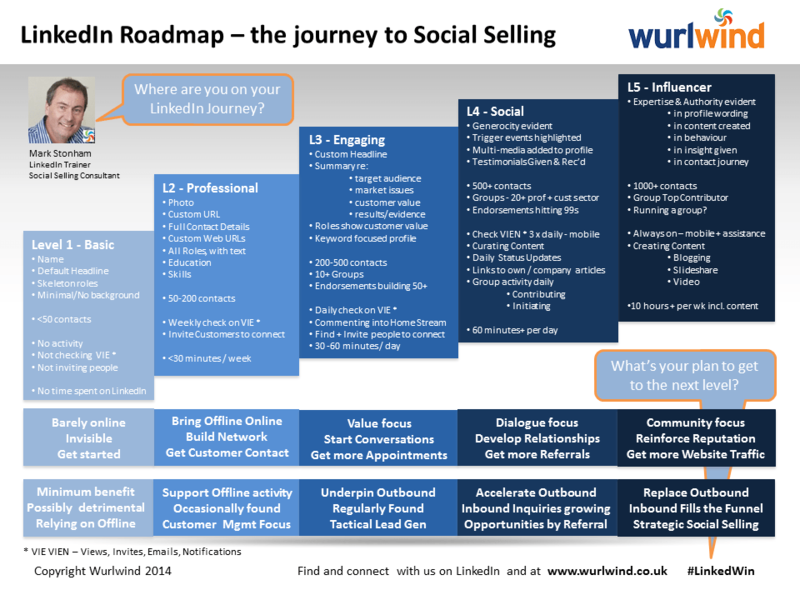 Check out the Wurlwind Social Selling Framework for an outline of a structured approach to achieve this. This level is more applicable for business owners and sales directors, rather than members of a sales team. It does take a certain mindset, methodology and commitment to become a thought-leader, to provide insight and educational content, and to be very publicly visible. Being geared up to handle inquiries in volume and being able to deliver in scale means that the resource commitment to LinkedIn and other social media and lead generation activity can be translated into significantly greater revenue for you, your team and your business. There is also a benefit in developing what I call a community mindset and co-operation culture, where customers, partners, staff in other departments etc. contribute to creating and sharing content. For example, it might be customers or customer services who are adding hints and tips about how to get the most from your product to your LinkedIn Company Page or discussion group. With the right proposition, community and content the percentage of inbound leads should increase handsomely, and allow outbound lead generation to diminish. Progressing prospects through the sales funnel is still necessary, although having structured customer journeys in place, using tools such as marketing automation, can result in a steady stream of well qualified warm leads. LinkedIn is creating opportunities for sales leaders and business owners to move their marketing and sales to another level. If you’re wondering whether time spent using LinkedIn is worthwhile, or whether training is a good investment, these are the benefits to weigh-up. Meanwhile there are organisations who are changing their approach to Marketing and Sales in ways outlined here, in order to become much more competitive. and those who ask: What happened? 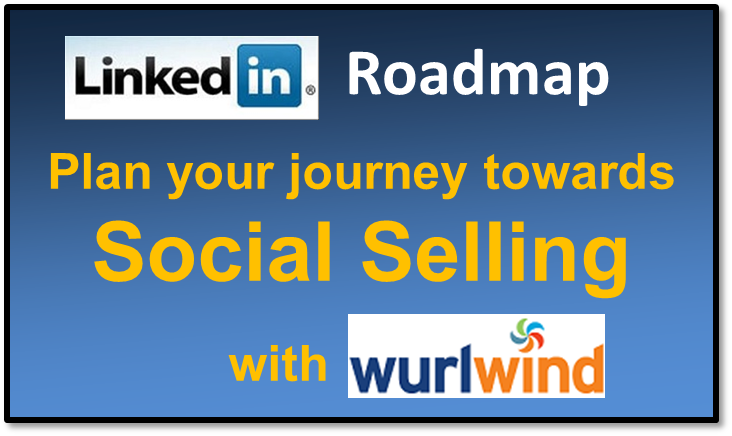 If you’d like further guidance to help you plan your LinkedIn journey towards Social Selling then please get in touch with me, Mark Stonham, and let’s start a conversation.